For 2013, the word that best described APCOM was consolidation. Keeping that tradition, this year we chose another word “spark”. 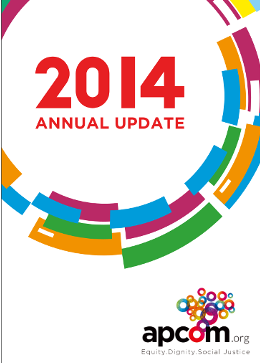 APCOM’s 2014 was a year of many new and exciting sparks for the coalition, the organisation and our work. A very important step for the coalition was the official registration as a Thai Foundation at the end of April. The registration will allow APCOM to operate fully independent and autonomous in every aspect of our work and organisation. This brings also new responsibilities and with support provided under the Global Fund Multi-Country South Asia HIV programme, APCOM was able to strengthen our internal systems in the areas of governance, finance, human resources, resource mobilisation, project monitoring and evaluation of all our programmes and projects. With our newly “sparked” organisation and systems, APCOM started implementing its new strategic plan in which clearly lays out how we will work to achieve our mission through four distinct strategies, all indicating and guiding the new layout of our work. A good example of how we now operate was the launch of the TestBKK-campaign in which we advocate for regular HIV-testing of our target groups at MSM and friendly health clinics in Bangkok, Thailand. A campaign to call for HIV-testing in itself is not new, but the way in which we organised it, was new and innovative. APCOM brought together a broad partnership of community organisations, the government, local health clinics and the private sector. This is a new and exciting model to share with many colleagues around the world. The campaign was the largest ever seen and unique for Bangkok and Thailand in general. Given its success, the campaign will for sure be repeated. Another spark was the re-launch of JumpStart. JumpStart is a capacity strengthening initiative for 8 MSM and transgender networks in Asia and the Pacific implemented by APCOM and our Australian colleagues from the Australian Federation of AIDS Organisations (AFAO). 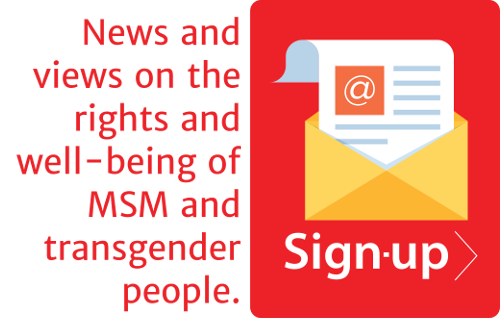 Using a peer-to-peer approach, the project provides technical assistance to MSM and transgender networks working at various levels to strengthen an effective HIV response. 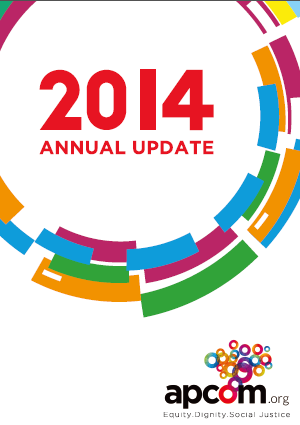 Click here to view our Annual Update 2014.